Bed risers are good for one thing, and that is raising beds a couple of inches more away from the floor. And while that doesn’t seem to be all to impressive, do consider that a couple of inches more of leeway down there has actually given you more space for storage. It’s no wonder that bed rises are popular in college, where dorm spaces are at a premium when you share a room with someone else. Bed Bath & Beyond is putting a twist on their bed risers, though. The store is currently selling USB port Bed Risers that won’t only give you extra storage space underneath your bed but even extra (and conveniently situated) power outlets and USB ports. Bed Bath & Beyond’s 8-inch Power Bed Riser provides extra power source where it’s needed and even gives its users the convenient technology of USB. The bed risers themselves are just rubber block, which are designed to raise a bed up to a maximum of 7 inches off the floor. What puts an interesting twist on them is the availability of the power outlets and USB charging ports. A bed riser possesses two 110-volt grounded power outlets and also has two 5-volt USB ports that let you charge your USB devices without having to boot up your computer or investing in a separate AC wall outlet charger. The Power Bed Risers come in a set of four with all four rubber blocks being powered by a central power cable that is 6 feet in length, which should be enough length to get to the nearest wall outlet. The Bed Bath & Beyond Power Bed Risers offer convenience in the form of four pairs of power outlets and USB charging ports. With that many outlets and ports available in a concentrated area, the bed risers make a good accessory for people who don’t have much living space to work with. College dormers and studio apartment renters come quickly to mind as the most common customers shopping for this item. 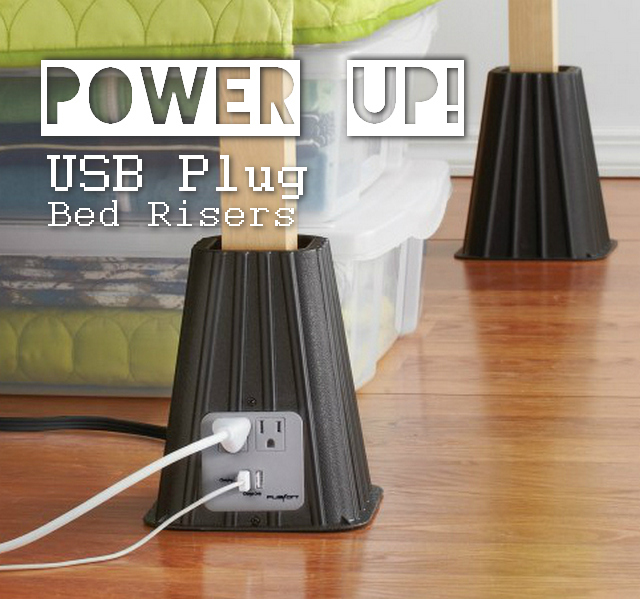 The USB port Bed Risers would then make a perfect back to school item for those going off to college or continuing on. There no more need to fight over power outlets or waiting your turn just to charge a USB device. As a matter of fact, it’s possible to freely share outlets with a roommate. The Power Bed Riser is available online at Bed Bath and Beyond for $24.99 each. This entry was posted in USB Gadgets and tagged Bed Bath and Beyon, Bed Riser, USB charger, USB Charging, USB gadgets. Bookmark the permalink.